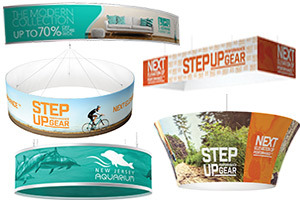 Display More With 2-Tier, 3-Tier & 4-Tier Multi-Pocket Literature Display Racks! Stepped or tiered pamphlet displays, also sometimes called tiered brochure racks with multiple pockets, tiered literature display racks, will keep your literature organized and enable you to display numerous leaflets, pamphlets, digests, magazines and catalogs in multiple pockets and in one central location. 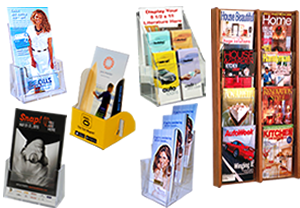 Multi-pocket, multi-tiered pamphlet displays, literature display racks and magazine holders are a great way to display various sizes of literature in one display. 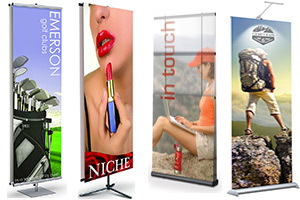 Display different brochure versions at once. For example, display different languages such as spanish brochures and english brochures. The "stepped" feature elevates your brochures on each tier showcasing the most important information such as your headings at the top of your literature. With these tiered literature racks, on lookers can clearly view with a glance rather than sort through messy piles of magazines on table tops in lobbies or waiting rooms. Some of our tiered literature racks or tiered displays were constructed for both counter top and wall mount use. The wall mount leaflet, magazine and pamphlet displays feature 2 keyholes on the back panels for easy wall mounting. This provides great functionality that provides you with the capability of easily and quickly moving your digest and magazine literature virtually anywhere on counters and walls. Some magazine displays and multi pocket literature holders feature brochure dividers so you can easily mix up your brochures and magazines in one business display holder. These multi-pocket holders, also referred to as 2 tier, 3 tier, and 4 tier magazine holders, are easily placed on reception and service center counters to inform their customers of their products and services. 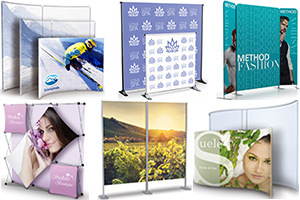 Resorts and hotels display these multi-pocket brochure displays or 2 tier, 3 tier, and 4 tier brochure holders to inform vacationing guests of local attractions, restaurants and entertainment in the area. Tri-Fold Brochure. The standard 'tri-fold' brochure is three panels with two fold lines. The inside flap is 3.624, the back cover is 3.688 and the front cover is 3.688. This size is also often used for take-out menus. Bi-Fold Brochure. Bi-Fold Brochures are also referred to as Half-Fold Brochures or One-Fold Brochures. 5 3/8" x 8 3/8 is the standard size for these bi-fold brochures, pamphlets and digests. Magazine & Publications. The standard size for magazines, publications and catalogs is 8 3/8" x 10 7/8"
Martha Stewart Living - 9" x 10 13/16"
Print Magazine - 8 7/8" x 12"
Rolling Stone Magazine, WIRED, GQ, Traveler, Bon Appétit, Vogue -8" x 10 7/8"
With cheap literature display racks or pamphlet displays like multi-pocket brochure holders, tiered magazine holders or tiered brochure racks give your customers a variety of booklets, brochures, catalogs, leaflets, publications and pamphlets to read while they are waiting for service or a doctor's appointment. We have a huge variety of sizes, styles and colors to choose your pamphlet displays from. Order online or call us today toll free @ 1-866-550-0656. Affordable Display Products, Inc. is your "one stop" literature display shop to meet all of literature rack needs.